This month, we get to know Stephen Rutherford. Stephen stumbled across the station while he was setting his alarm clock in his first year of University. He soon become one of the hosts of Reel To Reel for a time before helping to launch Tonight It’s Poetry Radio in 2010. The Thursday night staple, and companion to the long-running spoken word poetry series now calling Amigos home, featured an archive of Stephen’s meticulously assembled recordings from across North America. 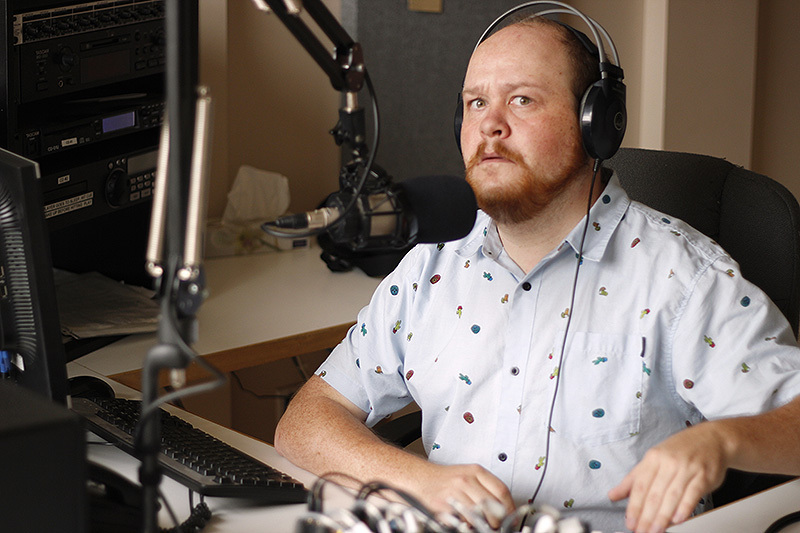 Stephen has also been the host of the Shakespeare on the Saskatchewan "Bardcast" every Summer since 2014, and you’ll recognize his air of gravitas in the odd CFCR advertisement. After an eight-year run, TiP Radio is now off the air, but we wish Stephen all the best in his future pursuits! I stumbled across Green Eggs and Ham when I was looking for a station to set my alarm clock to in my first year at University. CFCR has introduced me to a lot of the new music I've listened to over the years, and helped expand my taste a bit as well. I think it's important to have local voices on-air, and CFCR provides some great opportunities for that. Right now, a lot of what I consume on a daily basis is created elsewhere, and shared with people around the world. I think that ability to share and connect with people far away is wonderful, but it's also good to be reminded that people are doing fun, interesting, beautiful things here in Saskatoon. Community radio has been a good reminder of that for me. I always try to have some kind of backup material to switch to in case I run into technical difficulties while I'm on the air. If I'm running sound off my laptop, I'll usually have an audio CD cued or something else on hand just in case the laptop runs into software issues or something like that. A few years ago I had my laptop die on me early in the show despite being plugged in and fully charged, and the audio CD I had ready as a backup refused to play. While I talked about some of the live poetry events coming up on the calendar, I did my best to avoid sounding panicked and cued up a song I liked on a nearby CD. I managed to get the show back on track while that was playing, but it was tense. I haven't been involved with the show for a long time, but I still have a soft spot for Reel to Reel. Both The Buzz and Mom, I'm a Thespian have interesting interviews. Who is your favourite local poet? Non-local poet? My main thing is graphic/web design and I do a fair amount of photography/videography as well. Book: I just finished Success Through Failure: The Paradox of Design by Henry Petroski, which contains some interesting insights into how failures and disasters can help lead to new and interesting ideas. TV show: I just started watching The Good Place and it's pretty great.